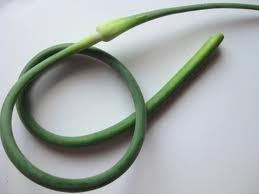 Wash the scapes under cold water and towel dry. Chop them up roughly so they fit in the bowl of your food processor. Put the scapes into the bowl of your food processor and add the Parmesan cheese and pine nuts. Cap the food processor and pulse a handful of times so that the ingredients are roughly chopped. Your finished pesto should be able to hold its own on a fork. (If you like your pesto thinner, add more olive oil.) Scrape the pesto out into a bowl. Garnish with pine nuts, if you like. The pesto should keep for about a month in the fridge, well wrapped. Like all pesto, it will separate. Just give it a stir before serving.